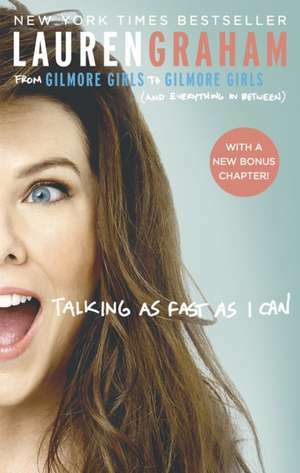 A NEW YORK TIMES BESTSELLER, Talking As Fast As I Can is a funny, intimate memoir by Lauren Graham, the beloved star of Gilmore Girls and Parenthood, which recounts her experiences on Gilmore Girls - the first and second time - and shares stories about life, love, and working in Hollywood. Random House – 03 Oct 2017 71.52 lei Economic 10-16 zile +5.91 lei 1-2 săpt. Random House – 29 Nov 2016 121.21 lei Economic 10-16 zile +10.28 lei 1-2 săpt.